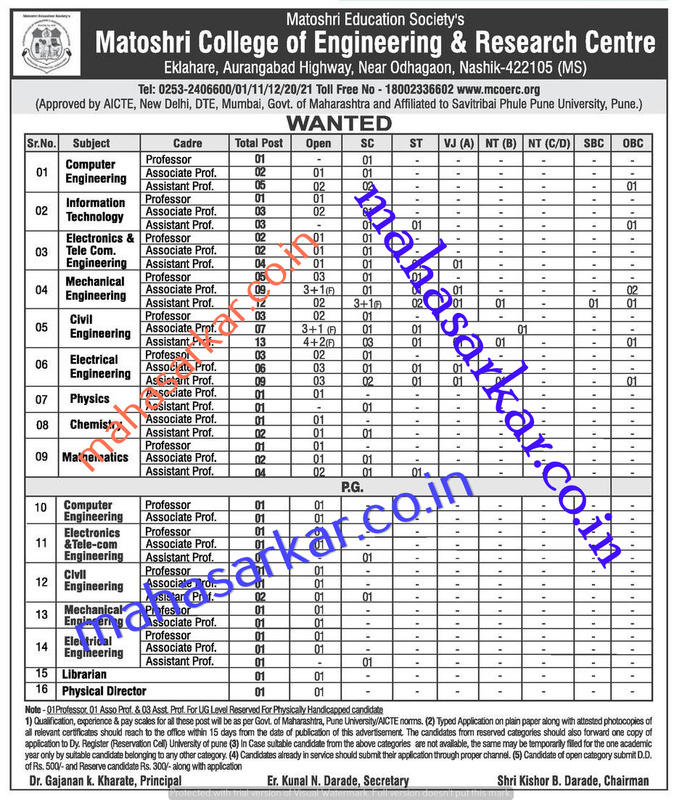 MCOERC Nashik (Matoshri College of Engineering & Research Centre), Nashik Published Job Notification for 122 Faculty Posts. Candidates who wish to apply must look at MCOERC Nashik Faculty Recruitment 2017. Eligible candidates can apply offline before 03-10-2017. Education Qualification: Graduate/Post Graduate/Ph.D/Master Degree and More. For Post wise Education Details follow the detailed advertisement. Interested & Eligible candidates can send their application along with all the necessary documents and testimonials to Matoshri College of Engineering & Research Centre, Eklahareshivar, Near Odhagaon, Opp Nashik-Aurangabad Highway, Nashik, Maharashtra 422105. Starting Date, Last Date to Apply Online at Matoshri College of Engineering & Research Centre which candidates should be remember as follows. Start Date to Apply Online: 19-09-2017.